Andhra Pradesh ECET Seat Allotment Order 2019 released. Check AP ECET Allotment Order, and download Seat allotment result. The details like college name, documents to submit, reporting time are available in the AP ECET Allotment letter. 1.4.1 How to Download AP ECET Allotment Order @ apecet.nic.in? Andhra Pradesh State Council of Higher Education (APSHCE) uploaded the AP ECET final allotment order on the official website. So, The candidates who appeared and waiting for admission in their favourite colleges can download the AP ECET Seat Allotment Order 2019. JNTU Anantapur issued the AP ECET final allotment order on behalf of APSHCE. The allotment order results released for diploma and degree holders to fill seats in various Engineering and Pharmacy colleges of Andhra Pradesh state. Hence, the Interested candidates can check and download ECET 2019 Allotment order PDF in the below section. ECET- Engineering Common Entrance Test for admission into various Engineering and Pharmacy colleges in Andhra Pradesh. On behalf of APSHCE, Jawaharlal Nehru Technological University Anantapur conducts ECET exam for Degree and Diploma holders. The government of Andhra Pradesh successfully conducted Engineering Entrance Test (ECET). AP ECET exam is a mandatory exam for Diploma and Degree holders to obtain admission in professional courses such as Engineering and Pharmacy. As a result of the ECET exam, AP government fill seats in 2nd year B.Tech/ B.Pharm colleges. Name of the Examination Engineering Common Entrance Test. Allotment Order Release date July 2019. JNTUA is located in the heart of Andhra Pradesh state. Jawaharlal Nehru Technological University, Anantapur plays a major role in conducting prestigious exam i.e. ECET. On behalf of Andhra Pradesh State Council of Higher Education, JNTUA took responsibility to provide a hassle-free test. The JNTUA is working continuously in producing quality technical graduates, scientists, etc. over four decades. To provide quality education for its students, JNTUA initiated many schemes and got success. Hence, JNTUA is ranked one among the leading technological universities in India. Andhra Pradesh state government successfully completed AP ECET -Engineering Common Entrance Test with the help of JNTUA. Are you the one who completed AP ECET Counselling and eagerly waiting to join in your favourite Engineering or Pharmacy College? Then there is no need to wait anymore because the AP government released the ECET Allotment order on the official website. Therefore the candidates who completed counselling and web options can check the AP ECET Seat Allotment Order here. Because we also provided the direct link of AP ECET final allotment list. Therefore, you can download the AP ECET Seat Allotment Order here. And report to the college within the reporting time mentioned in the AP ECET Allotment letter. The candidates who appeared for AP ECET Exam 2019 can follow the below steps to download AP ECET 2019 Allotment order from the official website. Or you can also find the direct link on our page. The following steps are helpful for the candidates who are searching for AP ECET Allotment Order Result. How to Download AP ECET Allotment Order @ apecet.nic.in? Login with your credentials in the candidate’s login section. Check the seat allotment order link. 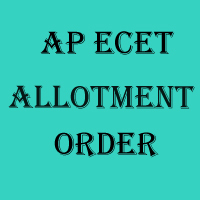 Download the AP ECET allotment order. Sir can you say Ecet counselling dates plsss……. Is the results of allotment really came out ahh.?? Plz don’t postponed the seat allotment…. Sir I loose my login id so pls tell me details pls pls sir…. Sir in Telangana (TS) can I get fee’s remebesmant and scholarship..In Btech sir. I am a AP student..I studied my Diploma in S.V.Govt polytechnic College. I got 521 branch rank in the stream of ECE. And I have reservation. Sir Can I get seat in Andhra university? My friend’s rank is 1468 but no seat was alloted to him In the 1st counselling.. While others who got a higher rank got in the same college.. Suggest whom to contact or what to do. Sir please conduct apecet 3rd counseling please sir.